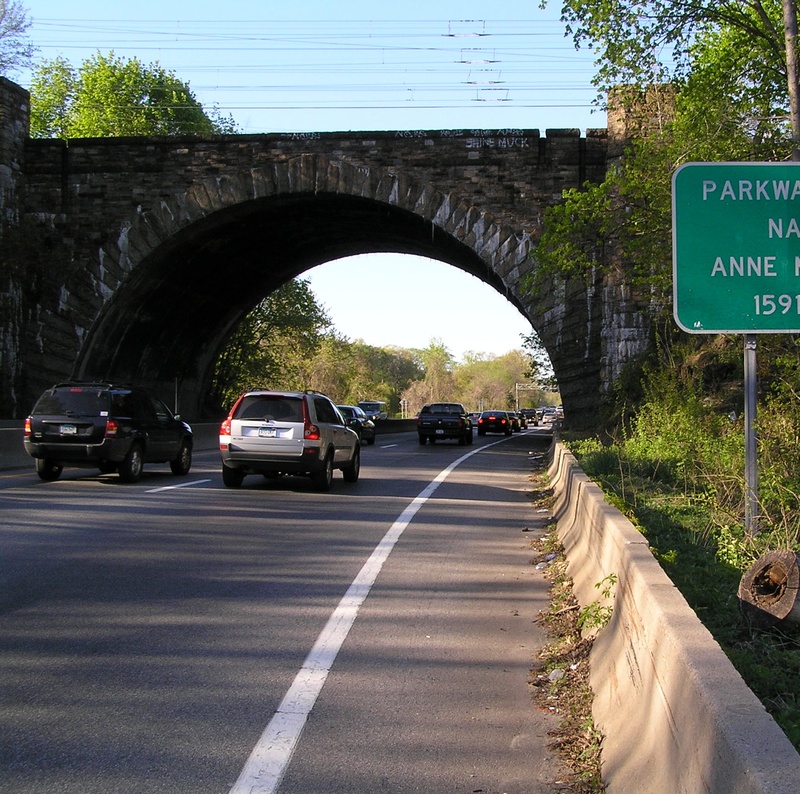 A stone bridge over the Hutchinson River Parkway, near Pelham, NY (about a mile from the bridge I stood on), May 3, 2007. (Anthony22 via Wikipedia). Released to public domain via Creative Commons. Thirty years ago on this date, on my fourteenth birthday, I was one thirteen-foot jump away from taking my own life. I’d felt this way before, quite a bit throughout ’81, ’82 and ’83, but I’d never come close to actually acting on my suicidal thoughts. I knew that despite getting beat by my then stepfather Maurice, neglected by Mom and family, ostracized at school and walking around with a kufi that only held the promise for more poverty, that my life wasn’t that bad. At least, compared to living in Biafra in the late-1960s or in Cambodia under the Khmer Rouge. I looked down at the cars underneath as I put myself, one leg at a time, atop the short stone wall, meant to keep young kids from falling off the bridge. As I stood there, I kept thinking, “What do I have to live for anyway?” Tears started to well up as I continued to look down at the cars as they zoomed by on both sides of the four-lane parkway. 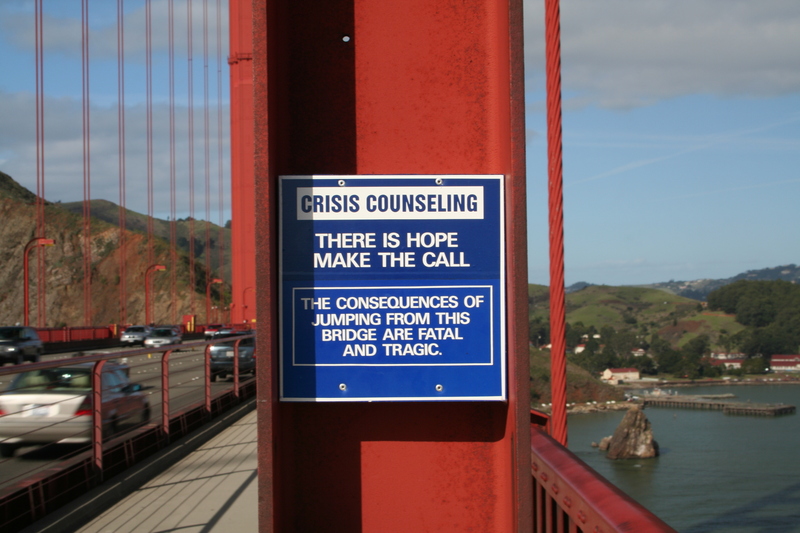 The suicide prevention message on the Golden Gate Bridge (#1 bridge in US to jump to one’s death), San Francisco CA, February 19, 2006. (David Corby/Miskatonic via Wikipedia). Released to public domain via Creative Commons. Then I had thoughts. And having any thoughts at all, especially thoughts of anything other than suicide, will short-circuit any attempt to kill yourself. One was of the remote possibility that taking my life could actually hurt someone else, Mom, my family, maybe even my classmates or teachers. A second, even more sobering thought was that I could survive the thirteen-foot jump. Only to be run over by a car going at fifty or fifty-five. And I could possibly survive that, too. But I’d end up brain-damaged or paralyzed or a vegetable or in a coma. There were too many risks involved to just jump off the bridge. For a few seconds I stood there, lost and not sure of what to do next. My next thought, my third one, was that maybe, just maybe, this is what hitting bottom really feels like. Maybe something good for me and my life was just around the corner. Maybe if I hold out a little longer, I’d find a reason to live my life and live it well. My fourth thought brought me to Maurice. “Wouldn’t that be the best revenge, that I overcome every situation in my life and become successful? Wouldn’t making the ultimate comeback from the edge of the cliff be better than ending it all now?,” I thought. With that, I got down from the stone wall and went on a long walk through Pelham before going home. I wasn’t relieved, but I wasn’t ready to take my own life yet either. This was the moment I decided no one else was ever going to make another decision about religion or my eternal spirit for me ever again. That I was no longer a Hebrew-Israelite. But I needed more to believe in, sometime bigger than me, because it was way too early yet for me to simply believe in myself. The only way being an atheist made any sense to me was only if there really was no god or God at all, and the scientific evidence didn’t lean in any direction. Plus, if atheism were a proven fact, and not just a belief born of both science and emotion, then suicide made perfect sense, and after coming off that ledge, it really didn’t seem rational anymore. Thank God Facebook or Twitter didn’t exist in ’83. Between Alex and Starling and Wendy, my family and their religion, our poverty and my PTSD, all it would’ve taken thirty years ago would’ve been one tweet or post, and the timeline for me that now includes three degrees, three careers, a wife and a son (not to mention two books) wouldn’t exist. But if there really are alternate universes, then I killed myself in at least one of them three decades ago. And to that version of me, I get it, I understand, and I’m sorry that you didn’t make it.